The idea of this crazy, ambitious but realistic project began in June 2011 as I returned from HELLFEST: to create a label to promote local metal beyond regional boundaries while providing logistical support, artistic eye and passion for local bands. Finisterian Dead End label is primarily a global concept, a simple but effective guideline where exchange, transparency and the will to excel help, to break the stereotypes of music distribution and will be in no doubt a new player with which one will now have to count. Its aim: to advise, guide bands on pressing, promotion, funding for their projects, have an outside artistic eye on them, manage a distribution album, and by all means find solutions for each profile. Utopia is certainly never far away, but no major project without passion! The leitmotiv of Finisterian Dead End: always let the artist free of their movements because they will never be a product! 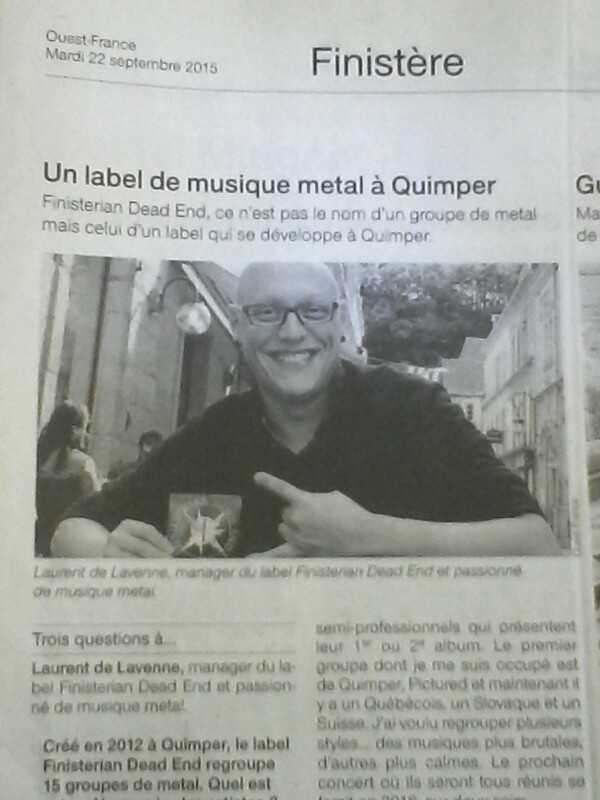 Finally, you will understand Finisterian Dead End Label is primarily a story of passionate people, a label for metalheads by metalheads. Far from the clichés and business that prevails in the music industry, art is always an end, the profit an indispensable means, but not the other way around. WELCOME TO THE DEAD END FAMILY ! !